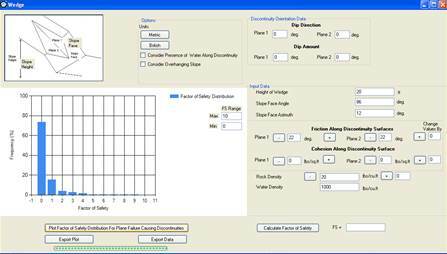 DipAnalyst 2.0 is an application software for kinematic analysis of rock slope failure potentials and calculating factor of safety values against failure. 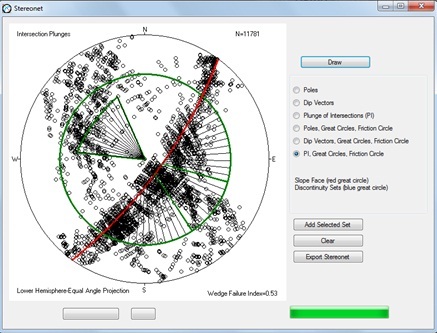 It is developed for stereonet-based analysis as well as a new quantitative kinematic analysis. The quantitative kinematic analysis, instead of relying on representative values, considers all discontinuities and their possible intersections to calculate failure indices. Failure indices are calculated based on the ratio of the number of discontinuities that cause plane failures or toppling failures or the number of intersection lines that cause wedge failures to the total number of discontinuities or intersection lines. 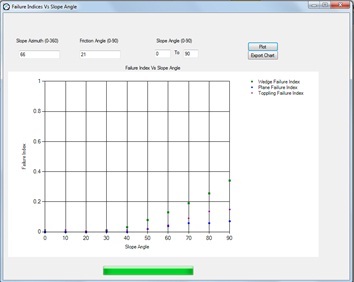 The software compares every dip direction/dip value with slope angle and friction angle to evaluate its potential to cause plane or toppling failure. It also calculates all potential intersection line plunge direction and amount for wedge failure potential. A higher index value for a given type of failure indicates a greater chance for that type of failure to occur. 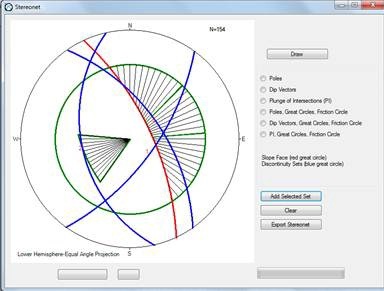 DipAnalyst 2.0 also allows a simple sensitivity analysis to evaluate the change of failure indices with changing friction angles, slope angles, and slope azimuths. The quantitative approach for kinematic analysis can be easily interpreted by professionals who are not familiar with the use of stereonets. 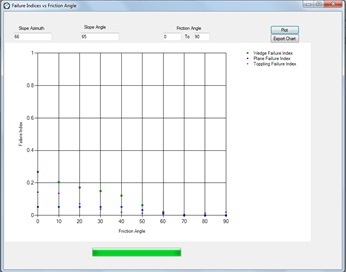 DipAnalyst 2.0 can also calculate factor of safety values for plane and wedge failures. Similar to the quantitative kinematic analysis, factors of safety values considering all discontinuity planes and their intersections can be evaluated. New data can be entered directly onto the dip direction and dip columns or can be imported from a .csv file, where the first column contains dip direction and the next column contains dip values. 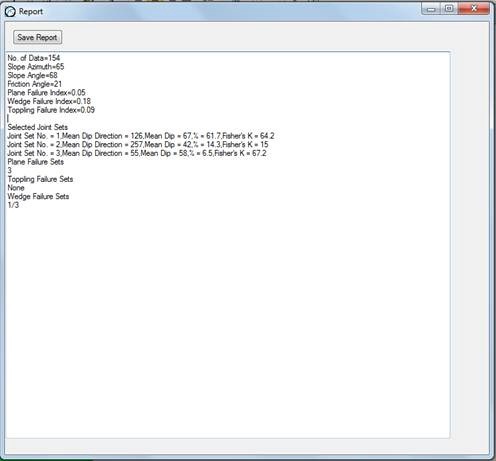 csv files can be created with Microsoft excel. Dip direction and dip data can be saved as .csv file. The ‘Discontinuity Intersection Calculator’ tool calculates the azimuths and plunges of all possible lines of intersection between all possibly intersecting discontinuity planes. Once executed, the other icons will be functional. Every time a new set of discontinuity data is entered or an opened data is modified, the ‘Discontinuity Intersection Calculator’ should be run. 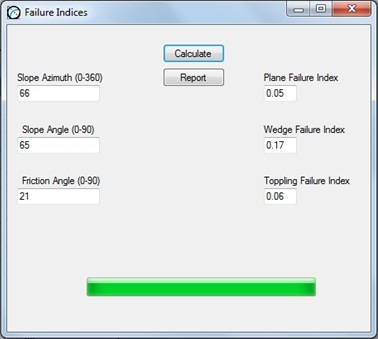 Failure indices are calculated based on the ratio of the number of discontinuities that cause plane failures/toppling failures or the number of intersection lines that cause wedge failures to the total number of discontinuities or intersection lines. The analysis would require valid slope azimuth, slope angle, and friction angle data. A higher index value for a given type of failure indicates a greater chance for that type of failure to occur. The ‘Calculate Failure Indices’ tool calculates all three failure indices as shown below. The resulting failure index can be exported as a text file by clicking the ‘Report’ button. The change in failure indices as a result of changing friction angle, slope angle, and slope azimuth is calculated. 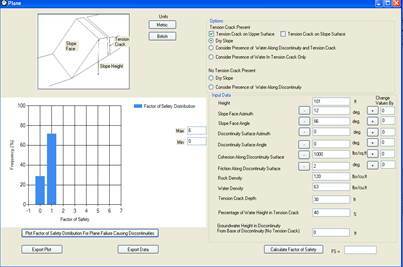 The user can modify the range of friction angles, slope angles and slope azimuths for which the sensitivity analysis can be performed. A scatter plot for each sensitivity analysis can be drawn. The scatter plots can be exported as a .bmp file by clicking the ‘Export Chart’ button. Examples of sensitivity analyses are shown below. The ‘Stereonet’ tool opens the ‘Stereonet’ window. Poles, dip vectors and plunge of all possible intersection lines can be plotted on the stereonet by clicking ‘Draw’ button. Based the symbol codes entered in the data entry, dip vectors and poles may be represented by different symbols. 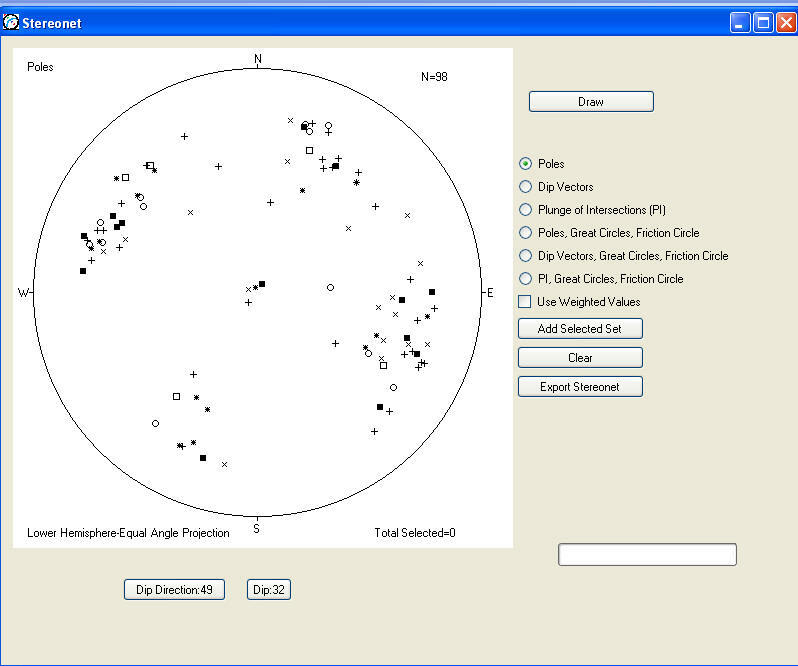 The ‘stereonet’ tool also allows stereonet-based kinematic analysis by checking the ‘Dip Vectors, Great Circles, Friction Angle’ radio button and clicking ‘Draw’. 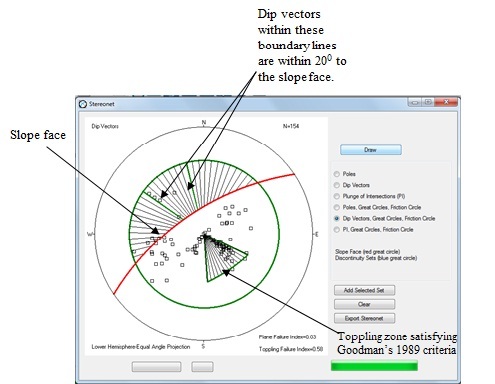 Plane and toppling failure indices are also provided on the stereonet with dip vectors. 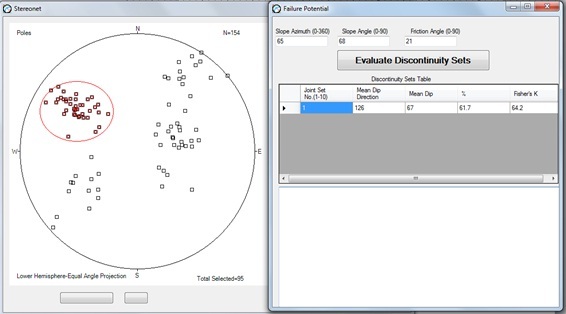 The stereonet-based kinematic analysis for wedge failure can be performed based on plunges of all possibly intersecting discontinuity planes as shown below. Cluster of discontinuities can be visually identified from pole plot of discontinuities. Selection can be done by left clicking at the upper left corner of the cluster set and holding down the mouse until reaching the lower right corner of the cluster set. The selected poles will be highlighted and the boundary around the selected set will be visible. The mean dip direction, dip, percentage of selected discontinuities, and Fisher’s K value can then be added into discontinuity set table by clicking the ‘Add Selected Set’ button. Clicking ‘Add Selected Set’ would also open the ‘Failure Potential’ window which contains the discontinuity set table. 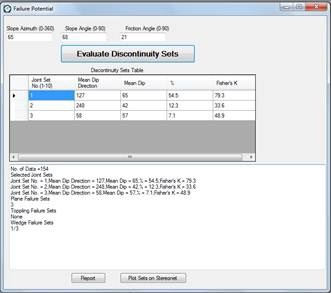 The selected joint sets can be evaluated by clicking the ‘Evaluate Discontinuity Sets’ button. The result is a text report of the mean dip direction, mean dip, percentage of selected discontinuities, and Fisher’s K values. It will indicate on which discontinuity sets would cause plane and toppling failures as well as which intersecting discontinuity cluster sets will cause wedge failures. Great circles representing discontinuity sets, slope face and the friction circle will be drawn by clicking ‘Plot Sets on Stereonet’ button. The ‘Report’ tool will open a window with a text box showing the result of failure indices calculation performed within the ‘Failure Indices’ window and discontinuity set evaluation within the ‘Failure Potential’ window. The ‘Report’ button should be clicked in the ‘Failure Indices’ window and/or ‘Failure Potential’ window for the ‘Report’ tool to record a report. The ‘Plane Failure’ tool opens the window for plane failure analysis. There are two options of analyses that DipAnalyst 2.0 provides. The ‘Calculate Factor of Safety’ button performs the calculation of factor of safety for one discontinuity plane based on the input data. The ‘Plot Factor of Safety Distribution For Plane Failure Causing Discontinuities’ plots a histogram of distribution of F.S values for all potentially plane failure-causing discontinuity planes entered in the discontinuity entry page. It first identifies discontinuities that have the potential for plane failure, calculates their factor of safety values, and plots a histogram. The factor of safety values can be exported. 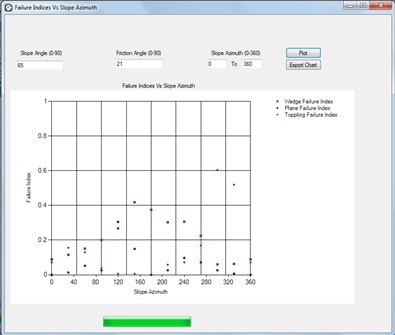 The ‘Wedge Failure’ tool opens the wedge failure analysis window. Similar to plane failure analysis, DipAnalyst 2.0 can calculate factor of safety for a single wedge defined by a pair of discontinuities as well as plot distribution of factor of safety values for all possible intersecting discontinuities that potentially can lead to wedge failures. The factor of safety values can be exported.